New Senate protocol would require all Senators to say “God bless you” at appropriate times. In case you haven’t heard, the Republican members of the 114th U.S. Congress are on a mission to (1) finally take down Obamacare, and (2) make this the session of Congress the most God-fearing session in history. Issues such as immigration reform, getting the unemployed back to work, affordable housing, and fixing our ailing infrastructure can wait, say Republicans, who are focused on the minutia that some say keeps them up at night. Take, for instance, the fact that now more than 3/4 of our population do not say “God bless you” when they hear someone sneeze (yes, look it up, the research exists). At least for two Senate members, i.e. Sen. Ted Cruz (R-TX) and Sen. Lindsey Graham (R-SC), this issue has been at the forefront of their agendas, and say that now that they have the support of a majority of their fellow Senators, it is time to take action. 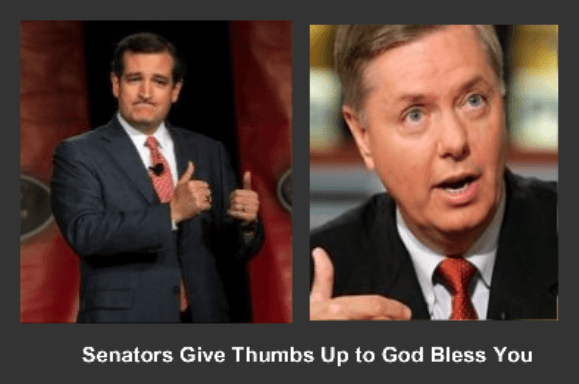 That is why Senators Cruz and Graham have joined forces and called on Congress to issue a mandate that would require all members of the House and Senate to make it their number one priority to say “God bless you” every time they hear one of their fellow Congressmen sneeze. “This has been eating at me for quite some time,” said Sen. Graham at a recent fundraiser for the Republican Party. “Just recently, I got the flu and was sneezing my fool head off, and do you know that only a handful of my colleagues took the time to stop what they were doing, you know, hand shaking, penning important legislation to get President Obama booted from the White House, things like that, to even say a simple blessing over my sneezes? I was appalled,” said the now-healthy (thank the Lord) Senator. “And that’s just the Republicans…forget about the Democrats,” he said. Graham and Cruz say they now have enough votes to get the measure passed as official protocol for every sneeze that occurs within the two chambers of Congress. “It is an idea whose time has come,” said Sen. Cruz, on his way to a luncheon to support saving the blackstrap molasses refining process which he says is under attack by the (in his words) “environmental nuts” running around trying to take blackstrap molasses out of the making of his favorite ginger snap cookies. If passed, the protocol would mean that every member of Congress who is Christian would be required to issue a “God bless you” in rapid response to anyone sneezing within earshot. “It’s the least we can do for our fellow Congressmen,” said Graham. Asked what he thought were some other important issues that should be addressed by this Congress, he thought for a moment, and then replied, “Well, for one, I’d like to see the bathroom stalls retrofitted with multi-media plug in receptors for our cell phones and iPads. “Those long lunches can play havoc on ones internal functions, and well, it would be nice to know that if my iPhone loses power while I’m in there, I can plug it in, and keep going (talking on the phone, that is),” he said sheepishly. Ted Cruz, in the meantime, said he is working on other pressing issues as well such as making sure there are enough limos to go around when a big luncheon is planned at an off-site location. “I, for one, am pretty darned tired of having to show up at an important fundraiser in a common taxi just because my assistant was a little slow on the draw in getting me an acceptable limo in time to ferry me to the event,” he said. Cruz’s idea would ensure that more than ten new limousine companies are added to the already burgeoning number of companies licensed to do business in and around the Washington, D.C. area. For the time being, just knowing that if they, or any of their colleagues, Christian or not, gets a cold or suffers from seasonal allergies are being blessed when sneezing, it will be one less issue ticked off the Senators’ important things-to-do lists. “Oh, and one last thing,” said Ted Cruz.